Welcome to my Henna website. I am a Mehndi body painter residing part time in Portland, Oregon. My website is dedicated to providing you with information about the ancient art of Mehndi quickly and easily. Enjoy! I now have some pictures of my work. At this time I am not doing Henna artwork. I hope to in the near future. As for now I have left my site up as it contains some helpful information on it. Please check back often as I hope to get back into providing my work for others enjoyment. 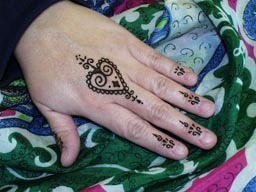 Want to join the Henna Mehndi Webring?